At Brad’s Design and Jewelry, we care about making sure that your most precious pieces of jewelry remain in great shape over the years. Unfortunately, over time, jewelry can break down and suffer damage. When it does, our team is committed to fixing your jewelry in a timely and professional manner, and always handle all jewelry repair projects with the utmost level of care. We have been in business in Crown Point for more than thirty years, and over that time, we have dedicated ourselves to refining the jewelry repair process. We are skilled at working with a variety of different materials, including gold, silver, platinum, and other metal types. We have also worked with watches, pendants, earrings, rings, bracelets, and necklaces. We encourage you to visit us for regular jewelry maintenance to ensure that your favorite pieces are kept in good shape for years to come. Our regular maintenance services include cleaning stones and metals, double checking prongs to ensure that jewels are properly secured and are not at risk of falling out, and polishing your jewelry and stones until they shine. We can also provide you with some at-home maintenance tips and suggestions for keeping your jewelry in tip-top shape for years to come. At Brad’s Design and Jewelry, we know that precious metals, diamonds, and gemstones are expensive – the last thing that you want to have to worry about is a lost diamond or a broken clasp. We also understand that more than just monetary value, jewelry also holds artistic and sentimental value, and damaging a piece or losing a stone can be heartbreaking. When you work with us, we focus on you as the customer, fully taking into account how important it is and how much it means to you. 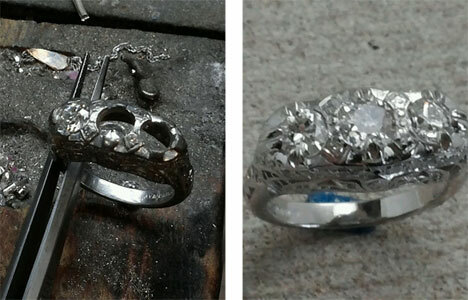 We never rush a project, instead our team takes the time that is necessary to repair a piece of jewelry perfectly. Our goal is to create life-long customers who will continue to refer us to their friends and loved ones for years to come. In order to do this, we put our heart into our work. We love jewelry, and we consider each piece we work with to be a piece of art. We are passionate about what we do, and guarantee satisfaction with our work. If you have a piece of jewelry that you love and that could use a little TLC, please contact us today. You can bring your piece into our location in Crown Point, or call us to discuss the repair first. You can also get in touch by writing us a message via the form found on our website.